Besides awhile ago when I tried to make maple caramel popcorn (and scorched a finger), I've never made caramel. Years before I've always just picked up Hershey's caramel sauce to spoon over ice cream or whatever else I had handy, but never have I made it from scratch. Until I made these brownies. White sugar, water, lemon juice, butter, whipping cream, and a pinch of salt. I like my caramel better. In fact, it was so good I never plan to buy caramel again. Ever. okay, okay-it was a little tricky, and you have to pay attention, but I know you can do it. However because it IS a bit technical, I have devoted a whole post to it that you want to read before you start. TRUST ME. These brownies are amazing. Much like a Caramilk bar, they are dark and delicious with a gorgeous layer of caramel, then toasted nuts and drizzled chocolate take them over the top. I brought half a pan to work and was told, with no reservations, that I was sincerely loved. Line a 9x13 inch pan with parchment paper, leaving enough so it extends up the sides for handles (these brownies are a bit messy, this will help with clean up). Measure out the flour, salt, and cocoa into a small bowl and stir. Set aside. In a saucepan over low heat, melt the butter and chocolate together, stirring until smooth. Set aside to cool slightly. Using a large bowl, whisk the eggs together until well blended. Gradually add the sugar, continuing to whisk until well mixed in. Pour in a small amount of cooled chocolate, whisking, to temper the eggs a little (you don't want to cook your eggs with the chocolate). Dribble in the chocolate a little at a time, stirring as you go, until you've dumped the whole lot in. Stir in the flour and cocoa until it's nice and blended, then add the pecans (if using). Pour the batter into your parchment paper lined pan, smoothing it out to make sure the batter is distributed evenly. Bake in the center of a 350 F oven for 20-22 minutes, until a toothpick inserted into the center comes out with just a few crumbs clinging to it. Press down any spots that are puffed up or have a bubble-you want this baby to be nice and flat as you are going to then pour caramel sauce all over it. Let your freshly baked pan of brownies sit on the counter for a good 10 minutes or so to cool. While it's doing that, make your caramel sauce. Start with making a batch of caramel (instructions here). After your caramel turned brown and looks done, remove the pot from the heat and add in the whipping cream. It's going to boil up, but don't worry-stir until it's calmed down, then whisk in the butter until melted. Stir in your vanilla and salt. 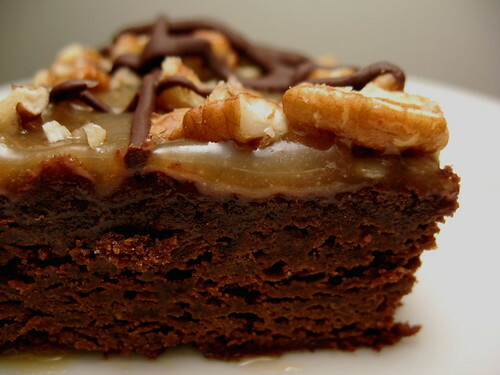 Allow the caramel to cool for just a couple of minutes, then pour the caramel over the brownies. Some is going to pool in the corners and drip down the sides, but no matter. Just use a knife to try to evenly disperse the topping. Let the brownies cool on the counter for about 45 minutes, then transfer the pan to the fridge to cool for an hour. Once the brownies are cool and the topping has set a bit, melt the chocolate with the cream over low heat. Pour the mixture into a resealable sandwich bag and snip off one corner, then drizzle chocolate all over the top of the caramel in a random design. Sprinkle with pecans. I like these best kept in the fridge, in a sealed container. They last about 5 days. Makes a 9x13 inch pan of brownies-how many depends on how big you like them!